I’m sure you’ll agree with me when I say that getting your financial life in order is not easy. It’s way too easy to become overwhelmed when it comes to managing money. Just think about all the things we need to do: get out of debt, save for retirement, budget daily expenses and make sure you have enough money in case of emergencies. Fortunately, Dave Ramsey wrote a book called The Total Money Makeover in which he prescribes his 7 baby steps. These baby steps are designed to bring someone from financial despair to financial independence. It’s a great system to start with if you feel overwhelmed when it comes to your money. Before we dive into the actual baby steps, you’re probably asking yourself: who is Dave Ramsey? And why should I listen to him? Dave Ramsey is an author and radio personality whose show is heard by over 8.5 million listeners each week. He’s written five New York Times best-selling books on personal finance. He’s one of America’s most “trusted voices on money and business”. I’m going to walk you through each of Dave Ramsey’s 7 Baby Steps which he covers in his Total Money Makeover book. If any of these steps sounds intriguing, I would definitely encourage you to buy a copy of his book and read it from cover to cover. These 7 steps are fundamental to achieving financial independence. 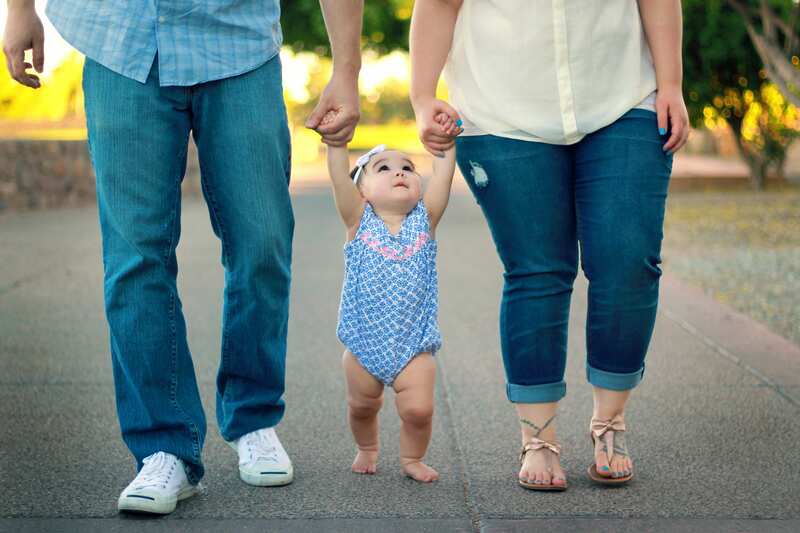 When getting your financial life in order, the first step is to make sure you have what Ramsey calls a “baby emergency fund”. You never know what life will throw at you. Based on past experiences, however, money emergencies tend to happen when they’re least convenient – like when you’re trying to pay off debt as fast as possible. The logic behind having a small emergency fund instead of putting that $1000 directly towards your debt is that $1000 is enough to cover most small money emergencies. Which means when (not if) an emergency happens, you won’t have to get into more debt. It would be mighty demotivating if all the progress you made on your debt the month before was eliminated because your car broke down and needed repairs. Having a small emergency fund protects your progress! If you do end up using your emergency fund, just funnel some money from your debt payments towards building your emergency fund back to $1000. Take action: Create a new checking account to keep your emergency fund nice and safe. The next step is to eliminate your debt. Dave Ramsey’s probably most well-known for his debt reduction strategy called the “Debt Snowball Method”. Unlike the more conventional “avalanche method” in which you pay your highest interest debts first to save you the most money, Ramsey advocates for paying your smallest debt first and working your way to your largest debt last. By paying your smallest debts first and then rolling your payments into a bigger and bigger payment “snowball”, you gain momentum and are less likely to become demotivated. This “baby step” is quite daunting. Paying off debt and staying debt free is hard. Debt free at last! Now it’s time to make some money moves to guarantee that you stay that way. First up, you need a bigger emergency fund. $1,000 is not nearly enough to cover anything but the smallest emergencies. What would happen if you lost your job? Your car breaks down for good? A loved one gets into an accident and needs thousands of dollars in medical care? The purpose of an emergency fund is to cover you in those situations so that you don’t need to get back into debt. Ramsey suggests that once you are debt free, you should put all the money you had previously used to pay off your debt into your emergency fund. Ramsey says everyone should have a 3 to 6 month emergency fund which means that you should save up 3 to 6 times your average monthly expenses. It may seem like a lot, but 3 months will fly by if you’re laid off and struggling to find another job. You’ll be happy that your emergency fund to fall back on during hard times. Once you’re debt-free and have a fully funded emergency fund, it’s time to look towards the future. Your retirement. Too many people put off saving for their retirement until their late 30’s or 40’s, which means they’re missing out on years of compounding interest gains. Ramsey suggests that you should put 15% of your income towards your retirement savings. While a 15% savings rate is well above the American average, it’s not nearly enough if you’re starting late in the game. Take action: Not sure how to get started investing? Learn how to invest $100. Next on the list is securing your children’s futures. Something which I found very reassuring in the Total Money Makeover is that Dave Ramsey makes a point of saying that a college degree doesn’t guarantee a successful future. He suggests that you should make sure that a college education is worth the cost of admission. Even if you don’t think your children will be attending college, having a “Future Fund” will help them get a head start in life! How much you want to put towards saving for your children is up to you and your spouse. Take action: Read about how to use tax-advantaged 529 plans for college savings. Once you get to this step, there’s only one more debt that stands between you and financial freedom: your mortgage. Putting all your extra money – after putting away at least 15% towards your retirement – towards your mortgage will save you thousands of dollars in interest. You may want to consider refinancing to a 15-year fixed mortgage to pay your house off faster. Even an extra $200 a month can save you thousands. 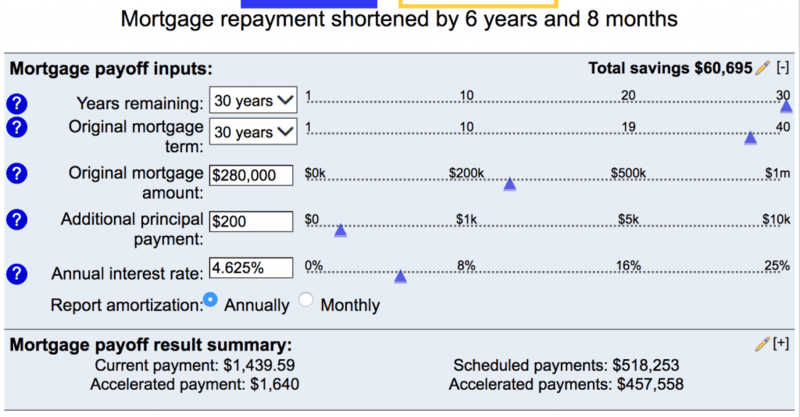 In the example below, if you paid an extra $200 a month towards the principal of the loan, you’d pay off the loan 6 years early and save over $60,000 in interest! This is, of course, the best step. You’re debt free and have set up all the systems required to have a secure financial future! Now it’s time to build wealth, be generous and build your legacy! Whether you want to spend money traveling or save towards buying a retirement home in Florida, the future is yours because you spent years being disciplined and working towards your money goals. Have you tried Dave Ramsey’s 7 Baby Steps? Have you read Total Money Makeover? Let me know in the comments below!